JT Brown’s life is one every Minnesota hockey player dreams of living. 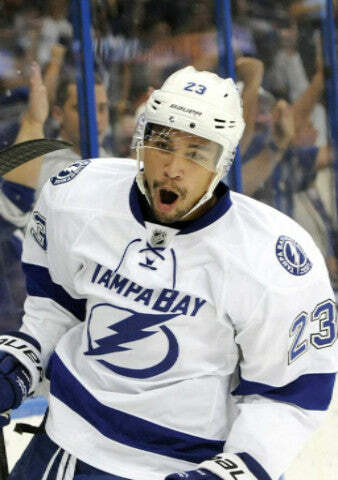 Brown is currently a right winger for the Tampa Bay Lightning in the National Hockey League. His path to the NHL lifestyle is filled with championship games, personal accolades, and tight friendships. Brown’s hockey career erupted when he decided to stay for his senior year at Rosemount High School instead of leaving early for the USHL. He holds the school record for career goals after depositing 75 pucks into the back of the net and recording 65 assists over his three-year career with the Irish. He attributes the majority of his athletic background to his father, Ted Brown, who was a first round draft pick by the Minnesota Vikings in 1975. Ted went on to play eight seasons for the Vikings. After high school, Brown played two seasons for the Waterloo Blackhawks in the USHL, but was not selected in the NHL Entry Draft. Brown tallied 113 points in 96 games in Waterloo, an atmosphere that every hockey fan should experience. “It’s definitely the best home barn in the USHL,” Brown said. After Waterloo, Brown achieved his Division I goal when he moved on to the University of Minnesota-Duluth for a hockey scholarship; that’s where the lights really started to shine bright for the humble Bulldog freshman. Brown has played a different role at almost every level of hockey since leaving Rosemount HS, which has helped him become a selfless hockey player. Following his sophomore season at UMD, Brown signed an entry-level two-year deal with the Tampa Bay Lightning. Three days later, he made his NHL debut in a 3-2 victory over the Winnipeg Jets, however his first game was overshadowed by NHL superstar and teammate Steven Stamkos. Brown’s NHL debut ended with Stamkos’ 56th goal of the season, an overtime winner. The next season, the NHL entered a partial lockout and Brown spent the year playing for the Syracuse Crunch—the Lightning’s top affiliate in the AHL. He was vital in the Crunch’s run to the Calder Cup Finals, but they ultimately fell to the Grand Rapids Griffins. After his first full season as a professional hockey player in Syracuse, he received his second call up to the Lightning in a season that ended in the Stanley Cup Finals. Brown knows his role with the Lightning, and sometimes that role means he has to drop the gloves. He has been in 11 professional fights. While Brown’s career is young, he has established an impressive resume; not many players can say they played in the National Championship, Calder Cup Finals and the Stanley Cup Finals in a four-year span. The big moments continued for Brown, who then married his wife, Lexi, whom he met in Syracuse while playing for the Crunch. Brown is currently living the life he once dreamed of, but he knows that it comes at a cost. His summer days begin at 7:30 a.m. when his alarm goes off and he drives to his 9 a.m. workout, followed by an 11:30 a.m. skate. He puts in his time training with the familiar faces of former teammates who also play professional hockey. After his training, he gets to enjoy his offseason days. Typically around 2 p.m. he decides on a nap, a Call of Duty session, or a round of golf. “I probably have to consider myself the best Call of Duty player I know,” Brown said. The video game is his favorite way to get away from the mental grind during the hockey season. JT Brown knows what it takes to be successful in all levels of hockey, and he strives to get better every day to help his team. The life, work ethic, and selflessness Brown represents is what makes him an UNRL athlete. “If you don’t have goals that are higher than where you’re at now, then somebody else will catch you.” - Joshua Thomas Brown.